Portland, Oregon, home to all things craft and micro, is emerging as the hub of a potential construction revolution that relies on materials from a century ago. Buildings as high as 12 stories made from wood—or, more specifically, multilayered wood panels such as cross-laminated timber engineered from Douglas fir cut down in the state’s forests—are cropping up across the city with hopes of spurring new projects here and across the country. Erecting tall buildings—normally the domain of steel or concrete—with engineered wood, or “mass timber,” has already been done in Australia and Europe, but this type of construction is nearly nonexistent in the United States. Done right, the buildings are cheaper to build and safer in disasters than steel and concrete ones, say proponents. And despite all the dead trees they entail, they’re also more environmentally friendly: The buildings actually sequester carbon in their wooden frames, whereas concrete manufacturing emits large amounts of carbon dioxide. The tallest wooden-framed buildings in the U.S. are under construction in Portland, a city whose ports have historically sent the state’s vast timber wealth around the world. “This is really the wave of the future,” says architect Benjamin Kaiser, whose firm has plans for an eight-story timber-framed residential building in the city. He describes cross-laminated timber, or CLT, as the “holy grail” as far as replacing concrete is concerned, since it’s lighter, stronger and better for the environment. One of the primary ingredients in concrete is cement, and to make cement you need to heat and grind up limestone or a similar material. In addition to the energy required to maintain that heat, approximately 1 ton of carbon dioxide is emitted per ton of cement produced, according to the U.N. And because concrete is the second-most consumed substance, after water, on the planet, cement production accounts for as much as 8 percent of human-produced carbon dioxide emissions. Using wood building materials to cut into that concrete reliance would have an added benefit: Trees absorb carbon dioxide, removing it from the atmosphere, and while they can take in more while living, a cut tree retains a portion of that gas in its wood, meaning a building made of wood is a repository of sequestered carbon. A living forest can obviously hold much more carbon dioxide than dead planks of wood. However, since CLT and other engineered wood products use lots of small pieces of lumber, the trees they are made from are young—generally 20 to 25 years, according to Kaiser—which means they haven’t trapped as much CO2 as old-growth forest. In addition, CLT can often include wood that is beetle-damaged or already dead for other reasons. Kaiser’s office is inside another building he designed, and wood is everywhere. Wood beams run across the ceiling supporting tongue-and-groove wood floors. Wood posts hold up the flowing five-story structure, dubbed the Radiator building, around a courtyard with white chromosome-shaped benches framed by wooden siding. 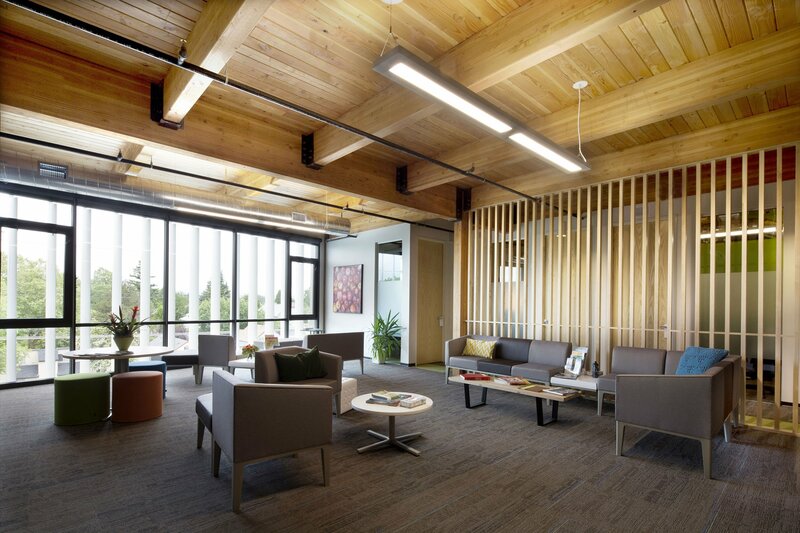 His firm, Kaiser Design, describes it as the first all-timber building of its size built in a century and a demonstration of the environmental benefits of carbon sequestration in buildings. They hope it kicks off a rebirth of using that centuries-old building material in large commercial buildings. Wood posts hold up the five-story Radiator building, the first all-timber building of its size built in a century and a demonstration of the environmental benefits of carbon sequestration in buildings. Caitlin Murray/Kaiser Group Inc. In northeast Portland, across the street from a coffee shop and a parking lot filled with food trucks, workers were assembling the third floor of a future office-and-retail building on a gray February day. Assembling is apt because, unlike concrete that is poured or lightweight timber framing that is cut on site into beams and studs, CLT is finished at the plant according to precise designs. When it arrives at the construction site, it is fastened into place in a way that is frequently compared to building an IKEA product. “It’s like putting together a cabinet. It’s just boards with metal connectors. If someone’s getting a saw out on site, that’s not good,” Robinson says. This project, Albina Yard, is using CLT made from Oregon Douglas fir. At the DR Johnson plant three hours to the south—the first in the country to make structural-grade panels—the timber is planed down to a thickness of 1.375 inches, laid flat and set end to end in a single layer. Another layer is glued on top perpendicularly, then another layer glued perpendicular to that and so on—generally three layers of boards for walls and five for floors, according to Lech Muszynski, a wood science professor at Oregon State University—until it is sent into a massive custom-built press for a couple of hours while the glue sets. Constructing multistory buildings out of wood isn’t without its challenges. If you live in the Pacific Northwest, you probably know that a wooden door that opens and shuts cleanly in the summer will, when the wet winter arrives, suddenly stick. What, critics say, will happen when an entire building is constructed out of a porous material that can soak up liquids? Water is a problem that is still being solved, says Timm Locke, of the trade group Oregon Forest Resources Institute. But, he adds, CLT and related products—such as the beams of glulam, another engineered material made of small pieces of wood layered and glued together to make something much stronger than its collective parts—should be able to manage the swelling and contracting of wood. Small gaps between the CLT slabs on the floor, hidden under the beams where they meet, would allow for the natural expansion, without the stress and buckling that could happen in a more conventional wood floor. Living in a wooden high-rise might raise fears that the building could go up like a campfire, but proponents tout the fact that large trees are naturally fire-resistant. They char, and that char retards the fire from burning all the way through. They say these layered-wood beams and slabs are basically large logs, burning at a rate of 1.5 inches per hour, according to Robinson. Robinson likened it to trying to light a log with a match, and both pointed to photos of melted steel I-beams collapsed over charred but clearly still intact wood beams. In Europe, most of these questions have been answered. But they’ll need to be reinvestigated in the U.S., where codes for building large, multistory buildings out of wood are nonexistent. 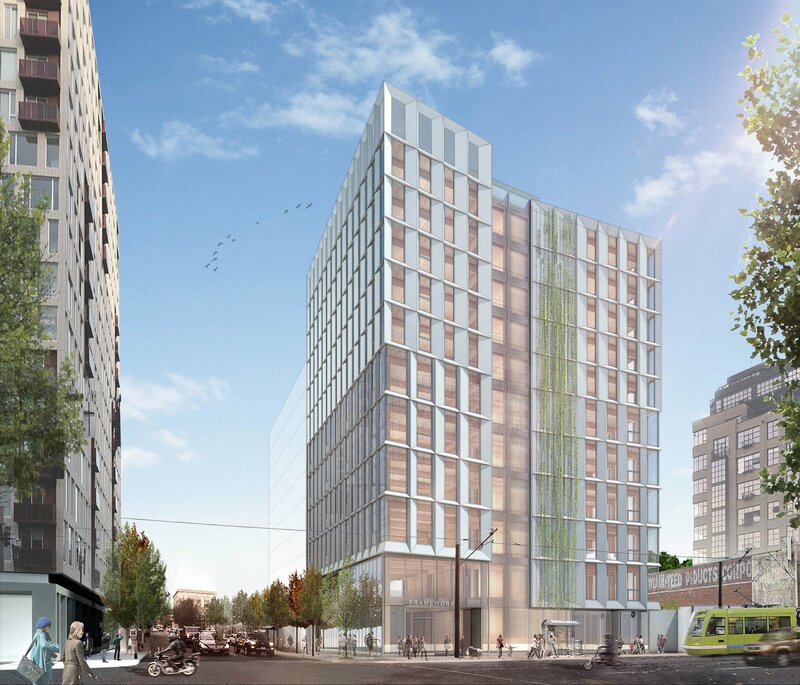 Once they’re addressed, more and more projects like the 12-story Framework construction, the four-story Albina Yard building and Kaiser’s eight-story Carbon Twelve will likely begin to rise across the country’s major cities. But it might turn out that those projects are simply a beta test for the real next-gen wooden buildings in the design pipeline. Those designs all use wood materials as replacements for concrete slabs and steel I-beams. But, says Muszynski, future designs should account for the unique advantages of a material like CLT. Consider its weight: relatively nonexistent, at least compared with concrete. That, says Muszynski, enables lower stories to support the weight of a building in a disaster, which means the materials are perfect for a simple, boxlike construction design in which every wall, internal and external, is weight-bearing—not unlike a very tall, very strong log cabin—rather than relying on the supporting columns and posts like most conventional high-rises. It’s “like large wood origami,” says Muszynski. The light weight—combined with the simple wooden box design and the fact that CLT comes in prefabricated panels, sometimes as long as 60 feet—also means huge labor, time and cost savings. A time-lapse video shot in 2013 of a wooden Melbourne apartment building being constructed next to an identical concrete one shows workers putting the finishing touches on the former while the concrete twin is still only a few floors tall. Correction: A previous version of the article inaccurately stated that the layered wood beams used in wooden construction burn at a rate of 1.5 millimeters per hour. They actually burn at approximately 1.5 inches per hour. In addition, the article misstated the hybrid building would be required for any structure over 80 feet. In fact, wooden building architects and developers believe they can go 150 feet high without a concrete core.